When it comes to marketing your services to the right prospect in a personalized way, telling your personal story within official marketing collateral can be highly impactful. However, working with the marketing department to create documents for your specific need can be time-consuming, especially when collateral is need on the spot. And creating material on your own may lead to branding and compliance violations. This may be life for many high-performing individuals and organizations, but it does not have to be this way? 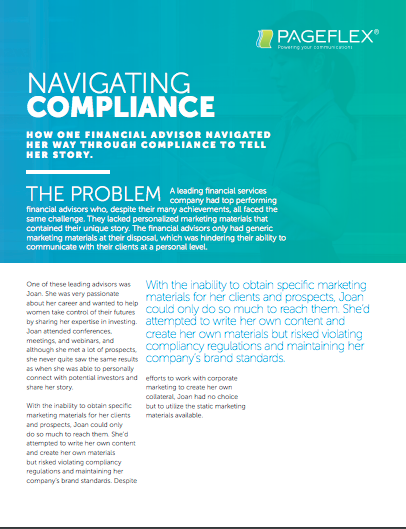 In this case study, you'll learn about one financial advisor’s struggle to connect with prospects in a personal manner. You'll also discover her company’s approach to addressing the need of enabling field marketing teams and a distributed sales force to market on their own. Complete the form to get your copy of the case study!